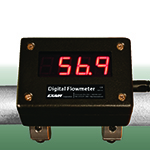 Digital Flowmeter is the easy way to monitor compressed air consumption and waste. Models are now available for ½” to 4” schedule 40 iron pipe and ½” to 6” in iron or copper pipe. The product is available with Summing Remote Display to monitor from a convenient location. The product is also available with Data Logger to record flow rate from once a second up to every 12 hours. The product has an easy-to-read digital display and is easy to install.